The fantasy football times are a-changing. After much speculation over the last couple months, Antonio Brown’s future was finally revealed over the weekend with the star wideout being traded to the Raiders for third- and fifth-round picks. Any time a player of Brown’s caliber switches teams, there’s a major fantasy ripple effect. For Brown, this has to be viewed as a downgrade. He’s spent his entire career with one of the league’s top signal-callers in Ben Roethlisberger. Since Brown entered the league back in 2010, Roethlisberger ranks sixth among quarterbacks in passing yards and passing touchdowns. Brown’s fantasy dominance started in the 2013 season, when he caught a massive 110 balls for 1,498 yards and eight scores. That was good enough for third among wideouts in fantasy scoring. He then rattled off three straight years where he finished as fantasy’s No. 1 wideout with that streak being busted in 2017 when he finished second at the position in fantasy scoring. Brown was on pace for another top finish last year, but missing Week 17 took him out of the running. It’s fair to view this move as a downgrade for Brown, but the good news for fantasy purposes is the Raiders are extremely thin at wide receiver. The current depth chart boasts the likes of Jordy Nelson, Marcell Ateman, and Seth Roberts. Jared Cook led the team in targets last year with 99, but he’s almost certainly going to bounce in free agency. That means plenty of targets for Brown. The Raiders attempted 556 passes last season. If Brown sees 29% of those targets, that projects out to roughly 161 targets. His career catch rate of 65.6% gives you 105.7 catches. Brown’s career yards per catch sits at 13.4, but he posted 12.5 last year. Using the latter number, we have 1,321 yards. Based on his career touchdown productivity, the conservative projection for his 2018 touchdown total is 8.7. Add that all up and you get roughly 290 PPR points. That would have ranked ninth among wide receivers last season but would have been third in 2017. 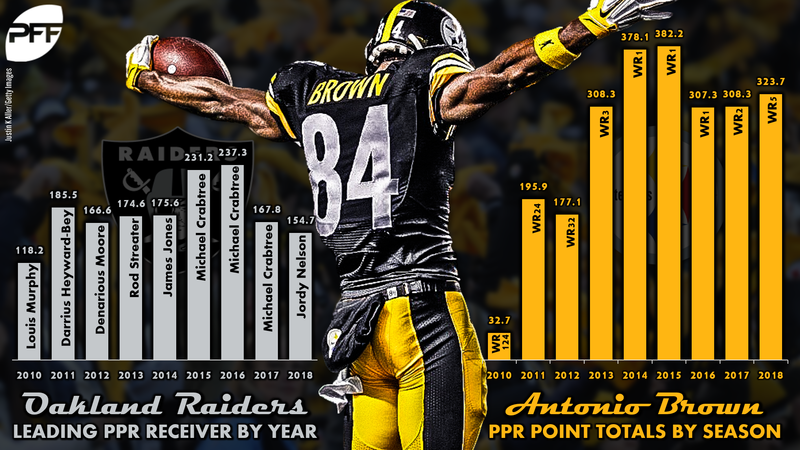 Regardless of how you slice it, Brown is still a high-end WR1 in Oakland. Of course, it should also be noted that Brown is entering his age-31 season. While that’s by no means “old” for a wideout in today’s NFL, it’s also not young. We’ve seen some of the league’s historically best wide receivers play at a high level well into their mid-30s, but we’ve also seen top receivers tail off when they hit the wrong side of 30. There’s no accurate way to know when Brown will decline, but Brown owners in dynasty leagues may want to consider unloading him sooner rather than later. To be clear, Brown is still a strong asset in redraft leagues, but his long-term arrow is pointing down. Derek Carr has been widely viewed by the fantasy audience as a disappointment over the last two seasons after he got off to start to his career. Carr finished 14th among quarterbacks in 2015 and followed that up with a 12th-place finish in 2016. Since then, he hasn’t been able to improve on that back-end QB1 finish. Injury derailed him late in 2017, and last year Carr finished 18th at the position. That being said, Carr did show encouraging signs of improvement last year. He topped 4,000 passing yards for the first time in his career. He also showed a dramatic improvement in his completion percentage (68.9%) and posted a career best 7.3 yards per attempt. For Carr, Brown’s presence is obviously a good thing, but it’s tough to view him as anything more than a mid-range QB2. 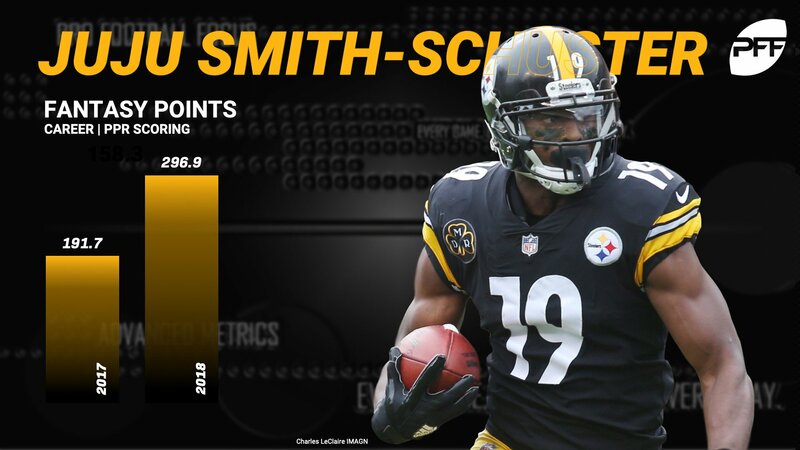 In Pittsburgh, we saw JuJu Smith-Schuster emerge last season with a massive 111 catches for 1,426 yards. Smith-Schuster wasn’t merely a second fiddle to Brown, as he finished just three spots behind Brown in fantasy scoring. With Brown out of the way, Smith-Schuster should see a slight uptick from last season’s volume, which now puts him in the just outside the elite tier of wide receivers. In fact, an argument could be made for taking Smith-Schuster ahead of Brown in 2019 fantasy drafts, including ongoing best ball drafts. Beyond Smith-Schuster, a lot of fantasy eyes will now be on second-year man James Washington. He entered the league with a lot of promise as a second-rounder out of Oklahoma, but Washington failed to make a major impression in 2018 with just 16 catches for 217 yards. Those numbers would figure to increase fairly significantly if the Steelers don’t address wide receiver in free agency or the draft. At this point, we’re in wait-and-see mode for redraft leagues. In best ball drafts, Washington is worth some March exposure, but it isn’t wide to over draft him. He’s fine to take in the WR4 range after 40 or so wideouts are off the board. Those who own Washington in dynasty leagues may want to take this opportunity to unload him as there’s a chance this is the peak of his value. Losing Brown isn’t a good thing for Roethlisberger, who is coming off a somewhat under-the-radar 5,000-yard season. In fact, only three quarterbacks have thrown for more yards that the 5,129 Roethlisberger put up last season: Peyton Manning, Tom Brady, and Drew Brees (three times). Since Brown broke out, Roethlisberger has been a top-10 fantasy quarterback four times, and likely would have been in all six seasons were it not for injuries. It’s going to be tough for him to match that productivity without Brown, but Roethlisberger’s ability and the Steelers’ system are enough to keep him in the back-end QB1 conversation.